If you’ve read my story you know that my journey began several years ago as a means of improving my life for the better. Little did I know how much that decision would actually change my life. When I started running I felt better, I noticed when I didn’t eat well I didn’t run well. So, I started eating better. Eventually, I realized that I loved learning about proper nutrition so much, that I decided to change my major in college from nursing to nutrition. From then on every year was dedicated to making improvements: eating better, being fitter, and living healthier. All of the pieces in my life fell into place because I was choosing to follow my heart and do what made me happy. I had no idea that one little decision to go for a run would impact my life so much. I had no idea that I would be living a healthy life style because I LIKED it. You see, when I made that very first decision to lace up my walmart tennis shoes for the first time back in 2010 it was a decision that I was going to live my life with NO EXCUSES. I didn’t know it at the time but it’s true. When you dedicate your life to something that makes you happy, when you allow it to overtake your mindset, you no longer need excuses. There is never a day that I say “I hate running! I hate being fit!” There may be days (especially here recently) that I may say “Dear god, that hurt!” but when I look back at the painful thing that I just over came (ie running 19 miles for the first time ever) I know that it was worth it. Why? because I didn’t think I could! I couldn’t even fathom how on earth I would do something like that, but somehow my body did it! The next time I’m facing something that is equally as painful or difficult I think about my past experiences and I KNOW that no matter what I’m about to face, it pails in comparison to the feeling of sheer awesomeness I will feel when I’m done. So excuses? Nah I don’t need em! I know now that one little decision can open a whole knew life that I could never even have imaged before. I also know that I’m capable of great things, things I can’t even imagine. Making excuses would just mean depriving myself of the possibilities. You have to follow your heart. You have to take chances. Excuses are just our way of holding ourselves back because we’re afraid. Preventing us from experiencing life to it’s fullest! Don’t be afraid! Toss your excuses away, you don’t need them! I’m making the most of this oppuritunity and I hope that my journey can an example to others. 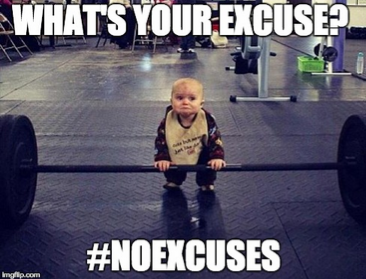 Now get out there and make today a day of #NoExcuses! NextI’m Bringing Yoga Back AND Taking the leap!